Unmanned drones, which may look like the one above, are being tested in six parts of the United States. If successful, the aircraft could be utilized by the likes of Amazon to transport goods. WASHINGTON — New York was among six states selected Monday to develop sites to test drones, a decision that likely will bring the unmanned aircraft to New York’s skies and badly needed jobs to upstate. The New York site will be at Griffiss International Airport, a former Air Force base in upstate Rome. Aerospace firms and universities in New York and Massachusetts will be involved in the research. The Federal Aviation Administration’s selection of the test sites represents a big step toward the commercial use of drones by businesses, farmers and researchers. Congress members lobbied to bring the work to their states. One study claims that Monday’s designation could could bring 2,700 jobs to New York and Massachusetts, boosting local economies. In addition to New York, Alaska, Nevada, North Dakota, Texas and Virginia were chosen after a 10-month selection process during which the agency sifted through 25 proposals submitted from 24 states. Six sites seen on the map above will be test sites for commercial use of unmanned drones. 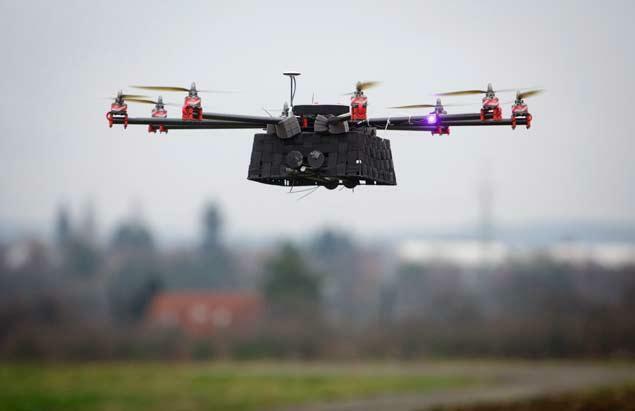 Drones, or unmanned aerial vehicle, are used primarily for military purposes but in 2013 the FAA began issuing licenses for commercial use of the aircraft units on a case-by-case basis. Consumers were appalled in December when Amazon revealed it was testing how it could use drones to deliver packages as part of its Amazon Prime Air service. The expansion of drones has not come without protest, though. Sen. Rand Paul (R-Ky.) famously launched a 12-hour filibuster in March to raise attention to how drones could violate the Fifth Amendment right to due process if the government used a drone to attack an American on U.S. soil. “Test site operators must comply with federal, state, and other laws protecting an individual’s right to privacy, have publicly available privacy policies and a written plan for data use and retention, and conduct an annual review of privacy practices that allows for public comment,” the FAA said in a statement.